Low Flyers Comedy Movie dropped by Major Movie Distributor because it was 'Too Offensive'. 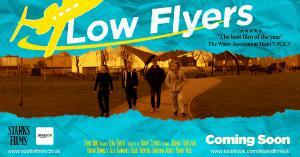 Independent British Comedy Film 'Low Flyers' Directed by Adam Starks had it's distribution contract terminated early this year for being too offensive. SOUTHAMPTON, HAMPSHIRE, UNITED KINGDOM, April 8, 2019 /EINPresswire.com/ -- In November 2018, Low Flyers achieve a distribution agreement with a main stream film distributor. The acquisitions department were happy with the production and requested a final screening to the company executives upon completion. When viewing the final cut of the movie just weeks before it's announced release date the agreement was terminated by the executives of the company largely based on joke regarding mental health issues made in the opening scene. The Director 'Adam Starks' commented “People take everything too seriously now, I don't think it caused offense to anyone it's some big companies are scared to do anything that may upset even just one person in fear that it will hinder their reputation'. Starks Films has stated that the movie will not be re-edited and instead go to other outlets for it's distribution such as Amazon Prime and it's sequel 'Low Flyers II' is still firmly on track for being shot this summer.